I broke down each position group immediately following the Super Bowl predicting what would happen, player-by-player. Now is the right time to see where things stand heading into the draft. The Seahawks certainly kicked the tires on veteran pass rush additions, most notably Jared Allen. 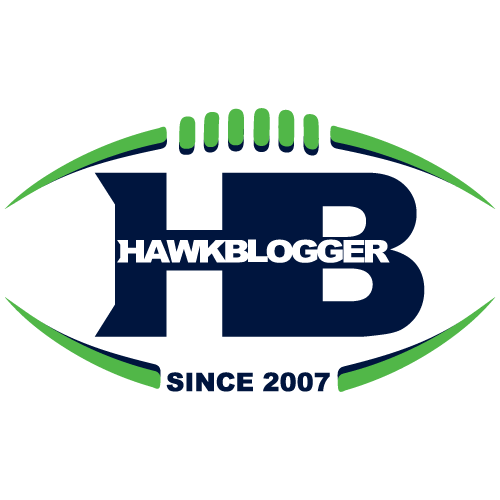 They also showed interest in Henry Melton and Jason Hatcher, who would have been interior rushers that could have replaced McDonald. The Seahawks definitely see an expanded role for Bennett no matter how the draft plays out. He should get a bump of at least 150-200 snaps next year, which would be more in line with a typical starting lineman. The team also has enough questions about their young players on the line that they wanted to spend sizable dollars to bring in a proven veteran either on the edge or in the middle, but they don’t feel desperate based on the discipline they showed in letting those guys walk. Greg Scruggs, Michael Brooks, Benson Mayowa, Jordan Hill, Jesse Williams, and Dewayne Cherrington have a golden opportunity. Scruggs is the surest bet of the bunch, but each has the potential to step forward. Mayowa and Brooks have the highest ceiling outside of Scruggs, and Cherrington is an intriguing nose tackle. A sleeper in the competition to start at LEO is O’Brien Schofield, who was recently re-signed. He started there when Clemons was out early last year. He is a smart, skilled player, who could probably get 7-8 sacks in that role. The defensive line is in good shape. Bennett and Avril are in tow. McDaniel and Mebane are still here. There is quality young depth that has the chance to step forward. Still, Schneider will definitely be looking to add to the pile come this draft, and every draft thereafter. Defensive line is just too valuable a commodity to ignore. The most valuable addition would be a young edge rusher. There is the least amount of certainty about how that role will be filled, although the addition of Schofield creates a higher floor than there was without him. People continue talking about the “Red Bryant role” as a gap. I think that is way down the list. That role was custom-built for Bryant and his skill set. The typical build of a Carroll 5-Tech defensive end is much more like Bennett. Plus, guys like Scruggs, McDaniel, and Williams all have the ability to help the team go bigger should they choose. 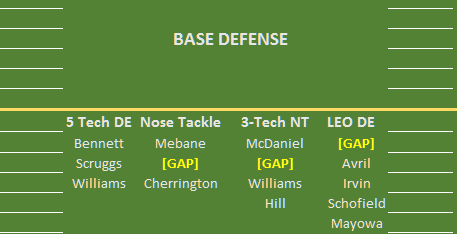 Mebane may not be around much longer, and the team is thinnest at that role. Expect the team to add at least a couple of interior lineman via the draft and undrafted pool, as well as at least one LEO-style edge rusher.